We understand that occupational therapists are busy. You simply don’t have time to compare and judge every mobility solution out there for your patients, and yet you need secure, reliable and safe recommendations that can help them regain their mobility and independence. Com Active can help. With our affordable pricing, dedicated customer service and high quality mobility scooters, you can make recommendations with confidence. With every Com Active Scooter we sell, we take the time to ensure our customers are completely delighted. We carefully assess their ability to operate a mobility scooter as well as educate them on how to drive it safely in their local environment. We also take extra steps to ensure proper maintenance and safety when using, charging and storing the mobility scooter. When you refer a client to us, our first step is to get to know them and understand their needs. We assess every patient individually to ensure that they can mentally and physically operate a mobility scooter in their environment. We look at things like their balance, coordination, depth perception and reaction times. If we should have concerns, we will refer them to a qualified OT who can properly examine them. Many of our clients are understandably thrilled the moment they first start using their mobility scooter. They treasure their newfound independence – and nothing makes us happier! We carefully instruct each client on how to properly use their scooter to help minimize accidents and incidents that could cause injury. We also take into account other issues that could compromise their safety, including impairments in vision or hearing. And although many of our clients understand the rules of the road, we still teach pedestrian rules, how to plan a safe travel route, maximizing visibility and much more. Should they need additional training, we will gladly provide this free of charge so that they can feel safe and secure when using their mobility scooter. We believe that proper training is paramount to our customers’ safety as well as the safety of others in their immediate environment, so we teach clients precisely how to brake, accelerate and move between objects – going forward and in reverse. We also teach them how to perform a three point turn, how to navigate footpaths with ease, and deal with pedestrian crossings, uneven slopes and bus stops. According to a study by the ACCC (Scooter Safety Report, Sept. 2012) only 10% of mobility scooter retailers give their clients adequate training. 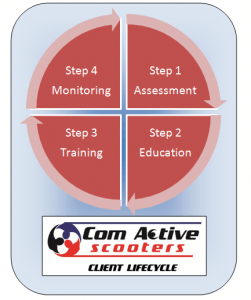 Com Active provides 100% FREE training at purchase and does so every year – right in the customer’s own home. As the client learns to feel more at ease and comfortable using the scooter, so too does their freedom and independence continue to grow. As clients become more comfortable using their mobility scooter, we monitor their progress at each step. Should they need more training, we’ll re-educate and re-train, as often as they need. If you would like a report of our findings, we’ll be glad to provide it so that you may assess it independently. Com Active sells only 4-wheeled mobility scooters, manufactured to meet or exceed a variety of national and international standards on pricing, safety, maintenance and usability. These four-wheeled models help our clients’ manoeuver even on difficult terrain such as sloping grades or gravel roads. Each scooter is pre-programmed not to exceed the legal limit of 10 km/hour, but should you wish, this speed can be reduced depending on the needs of the individual patient. We take our clients’ safety very seriously – and pride ourselves on providing scooters that can handle the demands of everyday life. With large, pneumatic tyres and a sturdy frame, as well as a safety steering tiller to protect the throttle, no expense is spared in helping our clients enjoy the pinnacle of safety. Does a client require a mobility scooter? Research shows that the benefits of mobility scooters go beyond the physical. Our customers also enjoy considerable psychological benefits from social engagement with their peers and community. By regaining their mobility, our customers become more active participants in their local communities. And our work doesn’t stop there. We’re always looking forward to the future of mobility scooters, including next-generation features like flashing LED lights, seat-activated cut-off switches and more. Whether your patient needs greater mobility in off-road situations, or just needs something portable for a smaller space, you can count on Com Active to recommend the perfect solution. Would you like us to speak at your OT practice?